Starting off with the comedies and it is of course comedy Wednesday on ABC with The Goldbergs kicking off proceedings at 8pm. Last weeks episode was a massive improvement on recent airings, and this weeks episode looks to be just as entertaining. “Flashy Little Flashdancer” – After seeing “Flashdance,” Beverly decides to take up dance with the Frentas and is dejected when the family doesn’t support her after telling them she is going to be in a recital. 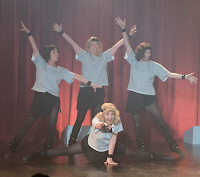 Meanwhile, when Emmy starts dating a cool guy, Adam thinks their friendship is in jeopardy, so he sets out to be cooler which backfires, on “The Goldbergs,” WEDNESDAY, APRIL 11 (8:00–8:30 p.m. EDT), on The ABC Television Network, streaming and on demand. If comedies aren't your thing then you can watch Criminal Minds at 10pm on CBS. There are of course only a few episodes left of the 13th season, and whilst rumours are flying around that the show has been renewed for a 14th season, fans concerns will probably be on whether all of the cast do return if the show is renewed. “All You Can Eat” – The Centers for Disease Control calls on the BAU when they suspect bioterrorism is behind a series of mysterious deaths in Virginia. Also, Garcia visits her stepbrother, Carlos (Sebastian Sozzi), to take care of a difficult family issue, on CRIMINAL MINDS, Wednesday, April 11 (10:00-11:00 PM, ET/PT) on the CBS Television Network. Over on Syfy at 9pm you can catch the 3rd season premiere of The Expanse. On FX Network at 10pm through to 11:07pm, you can watch the 3rd episode of The Americans final season. In the aftermath of a disastrous operation, Philip and Elizabeth clash about how to handle things with Paige. Stan struggles to contain the growing risks of Sofia and Gennadi’s fraying relationship. Written by Tracey Scott Wilson; Directed by Dan Attias. In the UK, on ITV 1 at 7pm is the 3rd of this weeks Emmerdale installments. Last night Charity dropped a heartbreaking revelation on her girlfriend Vanessa's shoulders, and tonight sees the aftermath of that along with Ross's struggles which you can see a preview of below. Vanessa takes matters into her own hands, Jimmy tries to deny the pressure he is under, and Ross grows desperate as his need for painkillers gets out of control. Following Emmerdale is of course a double helping of Coronation Street at 7:30pm and 8:30pm. Eva struggles with the prospect of giving up her baby, and Ali speculates about the cause of David's outburst. Meanwhile, Robert becomes a calendar pin-up. Toyah encourages Eva to be honest with Aidan, and David threatens Josh with the police. Elsewhere, Tyrone harbours hope of reconciling with Fiz. And of course finally, on BT Sport 2 from 7pm is the second round of the quarter-final between Real Madrid and Juventus. Real are of course favourites to win the tie, but given the extraordinary events we witnessed last night in Rome where Roma beat Barceloana 3-0 to win the tie on away goals? Anything is absolutely possible in football. For those watching at UK Pace, Sky 1 is airing the 16th episode of Legends of Tomorrow at 8pm, BBC Two has the 7th episode of American Crime Story at 9pm, E4 is airing the 17th episode of The Goldberg's latest season at 8pm, with the 18th episode of The Big Bang Theory following and the 2nd episode of Timeless at 9pm. What Are You Watching Tonight? Let Us Know In The Comments Below.